o In boxes (photo-safe) organized by year with names and dates when possible. Use sharpie pen on back of photos (no ballpoint because it dents the photos). o In frames to enjoy. Live with your photos! o On your computer – you will run out of space so consider an external hard drive, USB sticks, CDs or DVDs. USB drive sticks – at least 64 GB for personal use, but 128 GB is nice. Keep a few 16 GB on hand for sharing files with others. I like Patriot, Kingston, and San Disk. I prefer retractable styles so I don’t have to worry about losing loose caps. CDs and DVDs are also an option, but are easily damaged and are not always accessible via computer. ALL of these devices (computer, ehd, usb, CD, DVD) can fail so never rely on them as your sole backup! o On your phone and tablet. These count as “at home” options even though they travel with you because they live at home with you and could be lost in a catastrophe. You will run out of room on these devices so you will need backup (see below). o Google Photos – it’s free and it’s awesome! You can use a paid version, but not necessary. Automated and easy. REMEMBER that if you delete a photo in Google Photos, it’s also deletes on your phone and devices. Be very careful of deleting! Also, sign up for the free Photo Fabulous course at Modern Photo Solutions to learn how to use Google Photos like a boss. 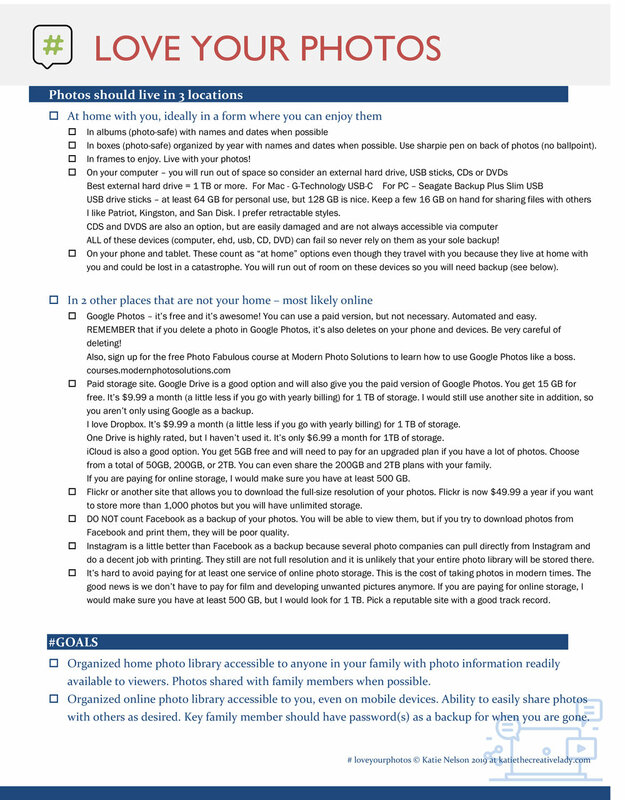 Google Photos has a nice help site as well so make good use of it. o Paid storage site. Google Drive is a good option and will also give you the paid version of Google Photos. You get 15 GB for free. It’s $9.99 a month (a little less if you go with yearly billing) for 1 TB of storage. I would still use another site in addition, so you aren’t only using Google as a backup. I love Dropbox. It’s $9.99 a month (a little less if you go with yearly billing) for 1 TB of storage. One Drive is highly rated, but I haven’t used it. It’s only $6.99 a month for 1TB of storage. My neighbor loves using Amazon Prime photo storage so I’m excited to look into that. You get unlimited free photo storage with prime membership and you can upgrade storage to add videos. iCloud is also a good option. You get 5GB free and will need to pay for an upgraded plan if you have a lot of photos. Choose from a total of 50GB, 200GB, or 2TB. You can even share the 200GB and 2TB plans with your family. If you are paying for online storage, I would make sure you have at least 500 GB, but 1 TB is ideal. o Flickr or another site that allows you to download the full-size resolution of your photos. Flickr is now $49.99 a year if you want to store more than 1,000 photos but you will have unlimited storage. o DO NOT count Facebook as a backup of your photos. You will be able to view them, but if you try to download photos from Facebook and print them, they will be poor quality. o Instagram is a little better than Facebook as a backup because several photo companies can pull directly from Instagram and do a decent job with printing. They still are not full resolution and it is unlikely that your entire photo library will be stored there. o It’s hard to avoid paying for at least one service of online photo storage. This is the cost of taking photos in modern times. The good news is we don’t have to pay for film and developing unwanted pictures anymore. If you are paying for online storage, I would make sure you have at least 500 GB, but I would look for 1 TB. Pick a reputable site with a good track record. o Organized home photo library accessible to anyone in your family with photo information readily available to viewers. Photos shared with family members when possible. o Organized online photo library accessible to you, even on mobile devices. Ability to easily share photos with others as desired. Key family member should have password(s) as a backup for when you are gone. o This is my folder approach to organizing digital photos (and scanned physical photos) on my external hard drive and in Dropbox. o Great post from Shutterfly with videos about how to organize digital photos. I will be posting more here in the next few weeks about how to love your photos more. I’m going to use the hashtag #loveyourphotos on social media and I invite you to use it as well if you end up being inspired to share something based on any of these ideas and resources. Follow me on Instagram and Facebook to keep in touch. Bookmark this blog or subscribe to posts via email for updates.